Earlier this year in a somewhat discreet, yet stylish manner, Apple introduced their latest 15-inch MacBook Pro while touting it as the most advanced Mac notebook ever. This time the upgrade was focused on the graphics processor, giving customers the option to upgrade all the way to a Radeon Pro Vega 20 GPU with 4GB RAM. In theory, this GPU coupled with 32 gigs of memory and a six-core i9 processor should be more than enough to turn the latest MacBook Pro into the ultimate mobile workstation computer. However, filmmaker Kyle Pugliese aims to question this hefty investment. In a dedicated video on the topic, he compares the rendering performance of a 2016 model 15-inch MacBook Pro to the newly-updated 2018 15-inch MacBook Pro. Before comparing the real-world performance of both counterparts, it’s important to point out each machine’s specifications. The 2016 MacBook Pro showcased in the video runs a Quad-Core 2.7GHz i7 Processor, a Radeon 455 GPU, 16GB of RAM, and a 512 GB SSD. On the other hand, the 2018 MacBook Pro boasts a Six-Core 2.9GHz i9 Processor, a Radeon Pro Vega 20 GPU, 32GB of RAM, and a 1TB SSD. With that out of the way, let’s look at synthetic benchmarks in Geekbench 4 to sort out the differences between the two systems. 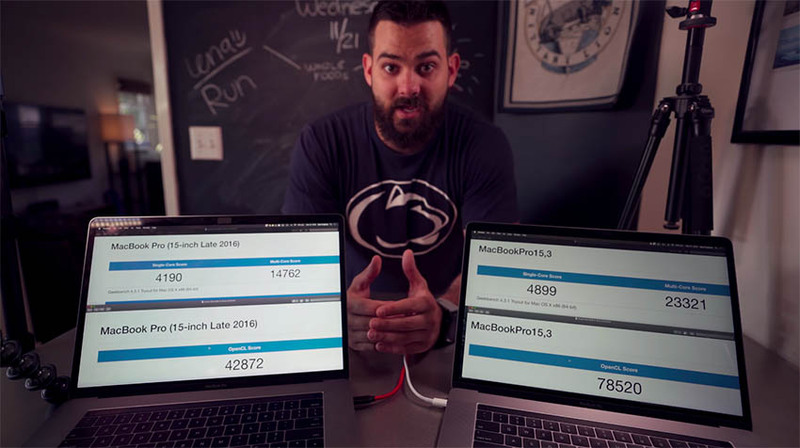 While the single score results are somewhat similar (because of close clock speeds), the multi-core scores show a significant increase in the 2018 MacBook Pro. Moreover, the newer Vega 20 GPU on the 2018 model delivers a drastic performance boost compared to its predecessor. Of course, synthetic benchmarks only gauge performance from a theoretical standpoint. The real test lies in the rendering performance when exporting clips from Final Cut Pro X. For the first test, Pugliese exported a 5 minute 1080p video project. On the 2016 MacBook Pro, the machine was able to render the video in 4.5 minutes while the 2018 MacBook Pro completed export in roughly 3.5 minutes. Based on those numbers, the 2018 model was only 38% faster than its predecessor, which seems to be pretty underwhelming result considering how much more specced out the 2018 MacBook Pro is. Moving onto the next test, Pugliese exported a 6.5 minute 4K project from Final Cut Pro X. This test resulted in the 2016 unit completing the rendering task in 15 minutes, while the 2018 model clocked in at around 11 minutes – 36% faster than its predecessor. A final test conducted was performed using Blackmagic’s Disk Speed Test. On the 2016 model, write speeds were clocked in at around 1029 MB/s, though Pugliese found the speeds to be pretty inconsistent when conduction multiple runs of the test. As for read speeds, the laptop produced a result of 2279 MB/s. On the 2018 MacBook Pro, the story was quite similar. Read speeds clocked in at 2657 MB/s, which was very close to the result of the 2016 laptop. The only real discrepancy between the 2018 model and its older counterpart appeared in the write speeds, indicating at a more consistent 2616 MB/s. Overall, there doesn’t seem much of a difference in performance between the 2016 and 2018 MacBook Pros. That being said, it’s quite difficult to justify the extra costs associated with the i9 processor, 32GB RAM, and of course the recently released Vega 20 GPU option. In other words, if you’re looking to spec out your MacBook Pro with price-to-performance in mind, upgrading to the Vega 20 GPU doesn’t seem to be the most reasonable course of action and certainly deserves consideration before making the leap.